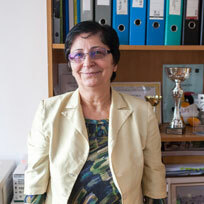 Associate professor Petya Asenova has a degree in Computational Mathematics from the Paisii Hilendarski University of Plovdiv. Petya Asenova holds two master’s degrees: Teacher of Mathematics (University of Plovdiv) and Informatics (Sofia University Kliment Ohridski). Her doctoral dissertation is in the field of applied informatics and information technologies in education at the Academy of Pedagogical Sciences in Moscow, Russia. In 1995 she specialized IT applications in assessment in education in Slovenia; in 2001 Information technologies in social sphere in Israel. She worked extensively at the National Institute for Education where she was Scientific Secretary. Since 2001 Petya Asenova has been a full-time associate professor at New Bulgarian University and has consecutively been Director of various Bachelor’s and Master’s programs such as Informatics, Network Technologies, IT Project Management, as well as Chair of the Department of Informatics (twice) and Dean of NBU’s School of Undergraduate Studies. Between 2002 and 2003 Petya Asenova initiated, created and oversaw a project to introduce Veda, an e-learning platform. She is the author and co-author of several active programs, i.e. Bachelor' Programs in Network Technologies (in English) with focus on Network Management and Computer Programming and in Information Technologies with focus on Computer Game Technologies and Business Informatics; Masters’ Program in Project Management in Information Technologies. Petya Asenova has three doctoral students under her supervision, two of which have already earned their doctoral degree. Petya Asenova has strong research interests in the field of e-learning, multimedia and the use of information technologies in education and other social spheres. Petya Asenova has rich teaching experience with courses in mathematics, discrete mathematics, algorithms, statistics, web design, multimedia, data base and school informatics. Petya Asenova is the author and co-author of over 60 scientific publications, 15 coursebooks and educational booklets. Petya Asenova has participated in a large number of international, national and NBU projects. She was a representative of a monitoring group of the Grundtvig Program with a two-year mandate; and an expert in the use of information technologies in education at the Council of Europe in Brussels. She participated in the development of two established national strategies in information technologies. She participates in the development of a wide range of programs of the Ministry of Education and Science related to informatics and information technologies for secondary education.